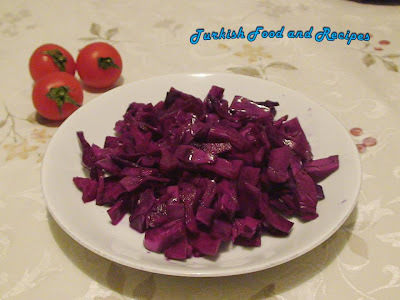 Take out the outer leaves of cabbage and wash. Place the chopped cabbage in a large bowl, sprinkle salt and mix them, squishing with your hands. 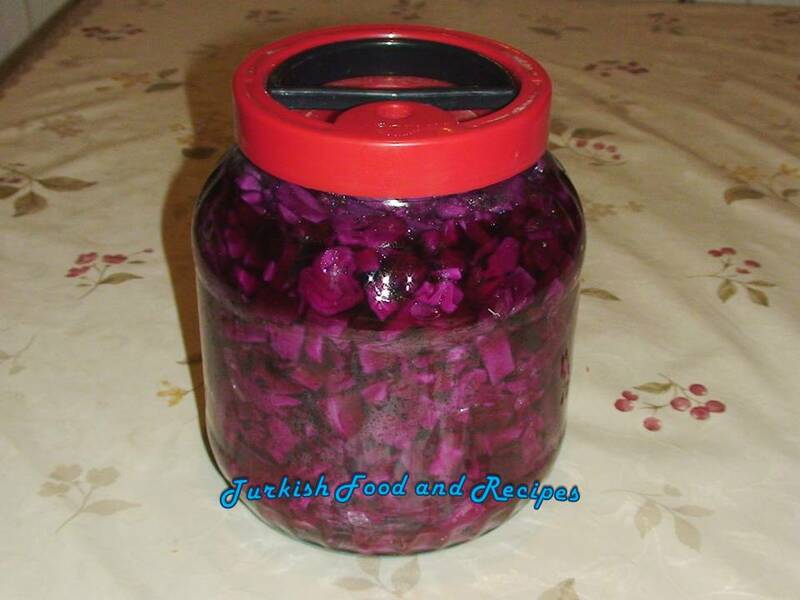 Fill the glass/plastic container with cabbage tightly. Press from the top to fill as much as you can. Then add vinegar and fill it up with water. Place plastic wrap over the container and close the lid, make sure it is sealed well. To mix the salt and vinegar equally, shake the container for a while. Store it in a dark place. If the place is cold, the fermentation will take place in 3-4 weeks. If it is warm/ room temperature, then it will be ready to eat in 10-15 days. Lahanin dis yapraklarini temizleyin ve yikayin. Ince ince dograyin ve genis bir kaba koyun. Tuz serperek harmanlayin ve elinizle hafifce sikarak tuzu yedirin. Agzi siki kapanabilen kavanoz/bidona sikica bastirarak yerlestirin. Ustten sikica bastirin, sirke ve uzerine cikana dek su ilave edin. Uzerine strec film koyun ve onun uzerinden kapagini sikica kapatin. Tuz ve sirkenin esit olarak dagilmasi icin kavanozu bir kac defa alt ust ederek sallayin.Karanlik ve nemsiz bir ortamda birakin. Ortam soguksa 3-4 hafta sonra lahana tursunuz fermente olmus ve hazir hale gelmis olacaktir. Eger ortam ilik/oda sicakliginda ise; tursunuz 10-15 gun icinde hazir olur. It's good to see you here betulonroad!!! Thank you for such a simple and easy recipe. 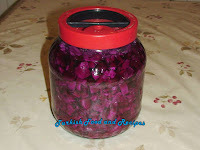 Since moving to Turkey I have started to make my own pickles and jams it much nicer to sit down to your own home made food instead of shop bought.